Okay, some days are meant for stories, others for delving into important writer issues, or spouting off an opinion. Today, is bitching day. I’m annoyed to hell with Google. I admire their tenacity in combating spam and abuse. 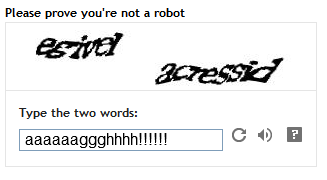 As a blogger, I sincerely appreciate the effort, but please for the love of God, get rid of the reCAPTCHA. 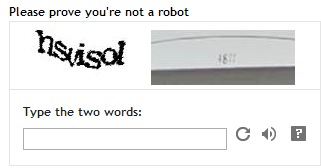 You know, the little rectangle box that asks you to prove you’re not a robot by asking you to fill in distorted words, or pictures. Seriously? Do any of the geniuses at Google understand America is turning gray? And, what happens as we age? We can’t see! “Beginning in the early to mid-forties, most adults may start to experience problems with their ability to see clearly at close distances.” American Optometric Association. You’ve got to be kidding me!!! What in those genius minds made them think requiring a visually challenged and aging population to place distorted words and pictures into boxes to prove they were not robots! If you believe CAPTCHAS protect you from spammers, perhaps. But it’s also frustrating the bejesus out of your visitors to your site. Don’t believe me? Tim Allen of Moz wrote a great post in 2013, Having a CAPTCHA is killing Your Conversion Rate. Although, CAPTCHA was designed as a user friendly system, a study conducted by Standford University showed otherwise. 71% can’t agree! That’s huge. Think of that in terms of visitors to your site. In fact, according to Moz, CAPTCHA’s became such a problem for Ticketmaster, in 2013 they stopped using it and went to another system. I don’t want spammers screwing up the Cow Pasture Chronicles, anymore than the fortune 500 corporations or Amazon. But, I don’t want my readers and visitors frustrated and, therefore, discouraged from returning either. I want my site to be many things; welcoming, warm, thought-provoking, humorous, a resource for other writers, and a place people want to return time and again. For me, Cow Pasture Chronicles shall remain CAPTCHA free. Google, I am NOT a robot! And, by the way has any of this nonsense worked with China? Hmmm? What do you think about reCAPTCHA’s? Do you hate them as much as I do? Have you ever given up and left a site because you couldn’t fill the damn thing out correctly?I’d love to hear from you. Talk to me. Tell me your story. You can follow me on Facebook at SheilaMGood and Twitter @cofcmom. I hate, hate those things. Detest them. Nothing makes me feel more brain dead. Thank you so much for reblogging my post. Glad you liked it and thanks for stopping by the Cow Pasture. Yeah, right. I click away most of the time when faced with them. 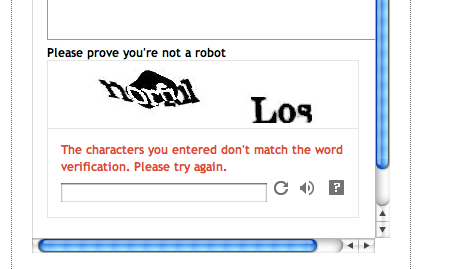 Either, I’m blind or illiterate when I try to fill the CAPTCHA’s out. LOL. Thanks for commenting and glad you stopped by.